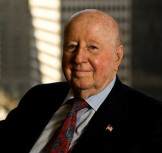 The former Chairman and CEO of Mitchell Energy& Development Corporation, a real estate developer and philanthropist, George Mitchell has been a true pioneer in many industries. A native of Galveston, Mr. Mitchell graduated from Texas A&M University in 1940 with a Bachelor of Science in Petroleum Engineering with an emphasis in geology. After serving in the Army Corps of Engineers during World War II, he consulted for a newly formed wildcatting company where he later became a partner. In 1959 Mr. Mitchell became president and under his leadership, the company grew and evolved into one of the nation’s largest independent oil and gas producers. His crowning accomplishment in the industry was pioneering the drilling and completion technologies that created a shale gas revolution. During the 1980s, the first successful application of this hydraulic fracturing technique enabled viable production in the dense shale formation known as the Barnett Shale. At the same time, Mr. Mitchell was envisioning a real estate project in the booming Houston area, a complete new town. Today, The Woodlands totals 27,000 acres with a population of 100,000. He and his late wife Cynthia were instrumental in encouraging and funding several philanthropic efforts in and around Houston, The Woodlands and the state of Texas. Together they took a leading role in the rejuvenation of Galveston’s historic Strand District by restoring more than 20 buildings; Mr. Mitchell was personally instrumental in the founding of the Houston Advanced Research Center (HARC), a research consortium headquartered in The Woodlands; and through The Mitchell Foundation, the Mitchells and their ten children, continue to support conservation, preservation and research.